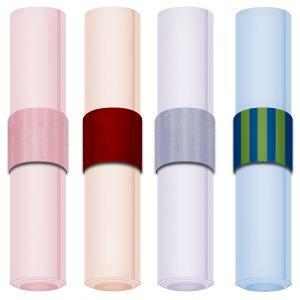 Paper towel rolls are one of those great free craft supplies that everyone has around the house, and they offer endless possibilities when it comes to projects. 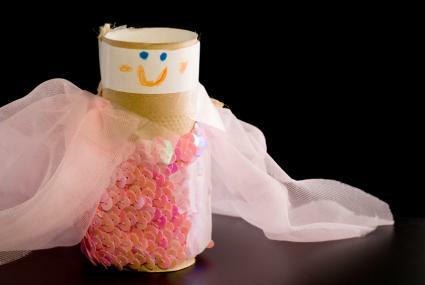 Whether you're a teacher looking for a fun preschool craft project or a parent trying to entertain her child on a rainy day, there's a paper towel roll craft that's perfect for your needs. You can use paper towel rolls and a few other common craft supplies to make a whole family of people to play with. In addition to encouraging creativity, this project provides a great opportunity to play pretend. Begin by cutting the paper towel roll into two pieces. The height of the tube will be the height of your doll, so it's up to you whether the roll is long or short. Cut a strip of white paper and glue the strip around the top portion of the tube. This will be the doll's face. Use the scissors to cut the yarn into several short pieces and glue these pieces onto the back of the tube where the ends of the white paper strip meet each other. This will be the hair. With markers, draw a face on the white paper. Use the glue to attach fabric scraps to make the doll's clothing. You can create dresses, capes, and shirts. 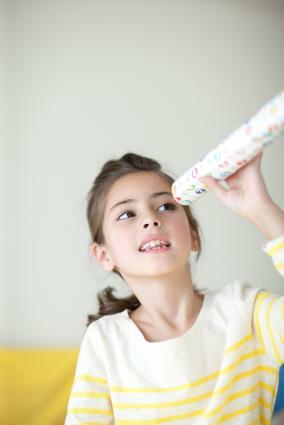 A paper towel roll can be the perfect way to begin a great game of "Pirate." All kids need to do is decorate the tube according to their wishes, and they're all set. You can adapt this craft for any age. Choose a paper towel roll and some decorative paper. Cut a piece of paper to match the length of the tube and fit all the way around it. Glue the paper onto the tube, covering the entire surface. You can choose pretty flowered designs, or the more traditional gold or black. Use markers and paints to decorate the paper or add glitter for some extra sparkle. Stickers are also fun. Allow the tube to dry thoroughly, and then get ready to play. Because of the characteristic shape, a paper towel roll is absolutely perfect for this project. All you need is a good pair of scissors and some paint. Cut the cardboard roll into equal-width pieces. Use a pencil to mark your cut lines every two inches along the roll. On a standard size paper towel roll, you will be able to create five napkin rings, with some excess at the end. With very sharp scissors, cut along the lines as evenly as you can. Try to make only one cut per ring. Next, it's time to paint. Line your table or floor with newspaper or drop cloth to prevent spills or damage to your surfaces. Place the cardboard rings in a row on the paper or cloth so that their openings are at the top and bottom. Paint the rings in your desired color, adding details like stripes and zigzags for fun. You can also add glitter or beads to make the napkin rings extra fancy. After both coats are dry, your napkin rings are ready to use. Just slip a nice cloth napkin inside and you have an instant showpiece for a dining room place setting. This is a great project to do with the kids, although an adult will need to help with the glue gun. These wreaths make pretty decorations around the home or fun gifts for friends and family. On your paper towel rolls, mark your cut lines with a pencil. This time, the pieces can be just one-inch wide. Using sharp scissors, cut each piece evenly. You should be able to get ten to eleven pieces out of a typical cardboard roll. Arrange the pieces on a newspaper or drop-cloth lined surface and divide them into two equal piles. Paint each pile a different color and allow them to dry thoroughly. Once your pieces are dry, it's time to assemble your wreath. Start with three of the cardboard pieces, arranging them so two of the same color are on either side of the alternate color ring. Create a "Mickey Mouse" pattern with your rings. 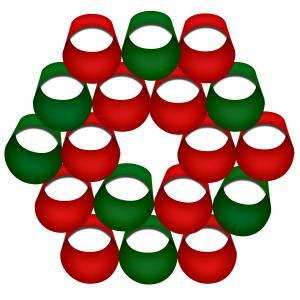 If the rings differ in color, the two matching color rings should be the "ears" and the other color should be the "face." With a hot glue gun or another strong adhesive, dot a small amount of glue at the points where each ring touches the other. Hold the two rings together for a moment so the glue can set. Repeat this for the third ring. The "Mickey Mouse" shape is just the beginning of your wreath. Your next piece will be glued on the bottom right-hand corner of the right "ear" of the shape, with the next piece going on the upper right-hand corner of that piece. Remember to alternate colors. Repeat this step until you have made a complete circle. How many pieces you use can vary, depending on how large you want the wreath to be. Once you have glued the last piece to the original pieces, creating a ring, your wreath is complete. To take your wreath up a notch, tie two small silver or gold bells to the bottom to create a festive look and a holiday jingle. Or for a harvest wreath, glue or tie a bundle of cinnamon sticks to the top of the wreath. This will create a spicy scent for guests when they walk in the room. Planning a party? There's nothing like party poppers to give your get-together a festive feel. You can make simple party poppers out of old paper towel tubes. Cut the paper towel roll in half. Each roll will make two poppers. Cut a piece of wrapping paper that is at least twice as long as the piece of paper towel roll. Wrap the paper towel roll in the paper, leaving the ends open. Secure the paper with tape. Close one end of the roll by gathering the paper together and tying with the ribbon. Fill the paper towel roll with little toys and candy. Close the other end of the popper by gathering the paper together and tying on ribbon. When you're ready to open the popper, simply pull hard on the end until the paper rips and the contents spill out. With all the great uses for paper towel rolls, it's easy to turn trash to treasure with a quick craft project. All you need are a few standard craft supplies, a little free time, and a bit of creativity.